Posted by jeremyliew in business models, churn, models, retention, social media, viral, viral marketing. I think this is a very useful model, but that it doesn’t quite predict what we typically see in real life. Rather than dropping to zero, failed viral apps typically hover at a steady level much lower than their peak. Since Andrew made the model available under “copyleft”, I made a small edit to his model. Rather than treating churn as a constant percentage of users in each time period, I treated it on a cohort level, with a higher churn rate in the early periods and lower churn as time goes on. 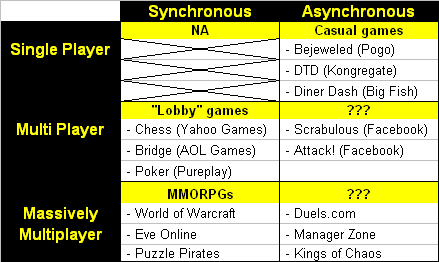 This is similar to the churn profiles seen for subscriptions businesses such as AOL’s ISP business. (I was at AOL from 2002-2005 as SVP of Corporate Development, and then as GM of Netscape.) 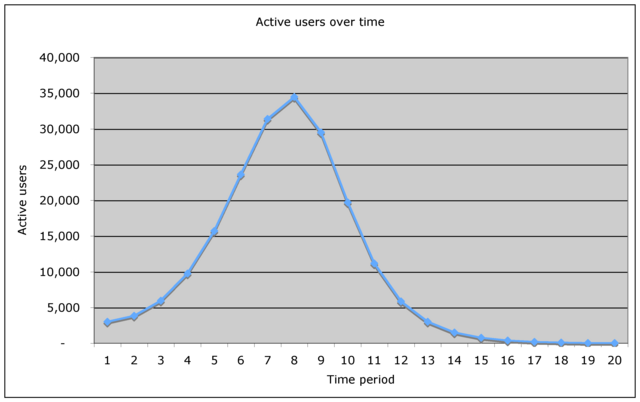 This model better matches active user graphs that we typically see for failed viral apps. If you’re interested, the model is available for download here. Viral growth assumptions are in the yellow cells on the “viral acquisition” tab and churn assumptions and output are on the “user retention” tab. Posted by jeremyliew in advertising, business models, distribution, platforms, viral, viral marketing, web 2.0. The last couple of years have seen an explosion of innovation on the web that has broadly been labeled Web 2.0. There has been a lot of debate about what exactly constitutes web 2.0 but what hasn’t received as much attention has been what changes have enabled these Web 2.0 companies to arise – what is different now from the mid 90s and Web 1.0. I think the change can be summarized in one (somewhat clumsy) word: Variablization. In the 90s we used software development models, primarily waterfall models, where a usable product wasn’t available until close to the end of the development period. Most code was written from scratch, with little reuse or public domain code, and large teams were necessary. With the popularization of agile programming methodologies, widespread use of open source software, greater ability to use offshore development resources on a consulting basis, and a culture of “open beta”, the costs of developing a website or web service have become both lower and more variable. Ideas that look promising but fail to capture user interest in beta can be identified much earlier and at much lower cost, and resources can be shifted to more promising avenues. In the 90s almost all content was created by professional editors and writers, employed by companies. To launch, they had to create a critical mass of content, which cost a certain amount. Recently, with lower expectations out of beta products, the widespread adoption of user generated content and emerging best practices in how to use user generated content, the costs of content creation have dropped dramatically and become variable. In the 90s, there were only two ways to get a large number of users. The first was offline marketing – the famous Pets.com superbowl ad approach. Expensive, and with a high minimum level of spend required to break through the clutter. We all know how that worked out. Overture and Google have changed that landscape. Their CPC model means that you can spend as much as you choose to gain new users, and that your marketing spend can be completely variable. The second way to get a large number of users in the 90s was to get a distribution deal with one of the big portals – AOL, Yahoo or MSN. In those days, this was the only way to reach a large number of internet users effectively, and you typically had to sign up for a multi year, multi million dollar deal to do it. As social network platforms open up, and as the basic principles of viral marketing become better known, distribution has become variable, if not free. The vast majority of Web 2.0 companies rely on advertising as their business model. I think this is because advertising is the one business model that has become variable (relative to the 90s). Back then, to sell online advertising, you both needed to have substantial scale, and you needed to have your own sales force. Today, thanks to ad networks and CPC contextual targeting (not just Google’s adsense, but also Quigo, Yahoo’s Publisher Network and others), even the smallest of websites can start earning advertising revenue. There have not been equivalent innovations for subscription and ecommerce business models, and as a result, we’ve seen far fewer web 2.0 companies that use those models. These changes in cost structure are a useful lens through which to view the current startup environment. It’s been said before that it is cheaper to build a company than ever before. While that is partially true, it is not the whole story. Digg has raised over $10m, Youtube over $12m, Photobucket and Rockyou (a Lightspeed company) over $15m, and Facebook has raised over $275m. (With the exception of Facebook) while these are lower than the amounts raised by companies in the 90s, they are still large numbers. Variablization of costs only makes costs go away when usage is low. In other words, while it still takes money to succeed, it is cheaper to fail than ever before. Luckily for VCs like me, that means that successful companies will still need to raise money! Posted by jeremyliew in business models, facebook, game mechanics, google, myspace, open social, product management, social media, social networks, viral, viral marketing, web 2.0, web design. Posted by jeremyliew in communities, Consumer internet, social media, social networks, viral, viral marketing. I recently met the CEO of a company who claim to be one of the most popular social networks in Turkey with several million monthly visitors from Turkey. This happened by accident – the founders are Americans who have no prior connection to Turkey. This is just one of many examples of how difficult it can be to predict or control the growth of viral social media. Google’s Orkut, is a better known example – a social network started by a Turkish engineer working in the US that now dominates in Brazil and India. Friendster and hi5 fall into this bucket as well. As I’ve noted before, the online advertising market in the US is bigger than that in the rest of the world combined. The senior management of these companies know this, and all would love to see more US traffic, but it is now beyond their control. The reason is the mathematics of viral growth. If the viral coefficient (the number of additional members a new member brings) in a population is less than one, it grows but eventually hits a ceiling. But if the viral coefficient is greater than one, it grows unbounded. Although your social media property may start in many different populations, it will come to be dominated by those with the highest viral coefficients. All three groups are initially equally represented, But already by time period 4 the population is more than 50% Green. 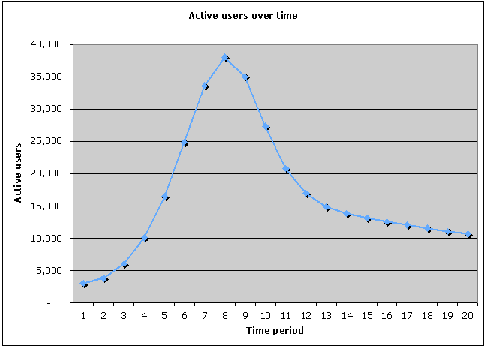 By time period 10 it is more than 75% Green and probably considered a “Green social network”. 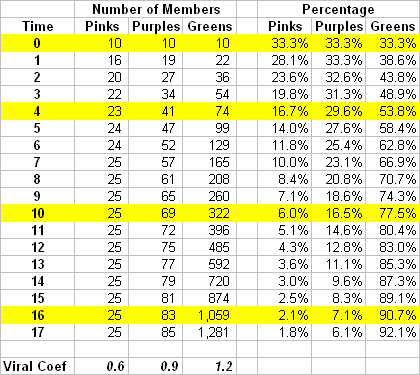 By time period 16 less than one member in 10 is not Green. For Green now substitute whatever national, language based, religious, racial or other demographic grouping that you choose. These evolutions can happen very fast since a time period is the time it takes for a new member to invite more members. 2-8 weeks might be a reasonable assumption. This example is vastly simplified, of course. Viral coefficients vary over time within and between groups. Viral coefficients also don’t vary quite as much between groups; the same underlying feature set is being exposed to all groups. But it illustrates the point that randomness can play a significant role in the eventual makeup of a social media property’s user base. I posted about a similar finding in May, how you don’t necessarily get the wisdom of crowds, but sometimes just the crowdiness of crowds. It was based on a NY Time’s article that showed how randomness can have a big impact on the most popular songs for a crowd when popularity information is public. Posted by jeremyliew in advertising, business models, Consumer internet, facebook, social media, social networks, user generated content, viral, viral marketing, web 2.0. Many people have been asking what a facebook app is worth. Andrew Chen at MDV says in an interview with Insidefacebook that a facebook app user is worth about 1% of a user on your website. Read Write Web points to the acquisition of the Favorite Peeps and Extended Info apps as evidence that real value is being created and predicts that there will be more acquisitions to come. Over at Valleywag, a Facebook Application Developer complains that no matter what an app is worth, it’s no longer worth the effort to develop apps for Facebook now that virality has been turned down. Marc Andreessen counters, says its only been five f______ weeks since the platform launched, the best is still to come. Charlie O’Donnell at Oddcast concurs, he says to app developers “Facebook doesn’t owe you a business model” – you still have to figure that out on your own, and points out that the customer acquisition is a pretty big benefit. As I’ve blogged about in the past, open platforms and distribution are two sides of the same coin. Similarly, value goes up as PV/user/month goes up. This argues that apps with high ongoing engagement (ie some aspect of ongoing utility) will be more valuable. Some apps (including some of the most popular ones such as Top Friends and Horoscope) don’t generate very many pageviews at all because all the value is delivered in the widget on the profile page, so few iframe pageviews get delivered. These fall mostly into the self expression or communication categories. Apps such as iLike on the other hand, generate a lot of ongoing engagement and PVs. Value goes down as monthly churn goes up. One of the factors that reduces churn and increases “stickiness” of an app is how much “archive” value is built on top of the app. The more you commit to adding information to an app, the stickier that app will become. Pets is a great example of this – as you “level up” your pet and get more equipment for it, you become less and less likely to get rid of it. Fortune Cookie is an example of an app where there is little archive value and its easy to either switch out to a new app or get rid of it altogether. Finally, value goes up as virality goes up. Although Facebook has turned down the virality of apps recently, certain apps, primarily those with a communication and self expression component, tend to be more viral in nature. Lance and Jia of Rockyou (a Lightspeed portfolio company) did a good interview with Venturewire where they talked about how to get viral on Facebook. All Facebook apps are not created equal on these four dimensions. If you’re building a Facebook app, it’s worth while thinking about your app using this framework to figure out how important it can be to your business. I’d love to hear from developers of Facebook apps to hear what they think about this framework, and how their app measures up against it.